Most people and particularly women will tell you that they do not drink enough water. Drinking healthy water is essential to health, beauty and longevity. One can survive without food for 40 days, but ones health will gradually deteriorate without water after two days depending on temperature and amount of body water loss. increases its effective functions on the human body. So what’s the correct time for drinking water and its benefits? Benefits of Drinking Water and its Functions in the Body? Now for alkaline water, when and how do you drink that? Ionized alkaline water is beneficial because of its ORP (Oxidation Reduction Potential) that makes it an antioxidant and its alkalinity (High pH-balance). The antioxidant (the higher the ORP, the better) last approximately 18-24 hours. The Higher pH will last approximately 1-2 weeks. The smaller molecule cluster size will last approximately 1-3 months. For best results, drink the ionized alkaline Water immediately after you pour it from your machine. We recommend drinking alkaline water in between meals. Water consumed between meals will very quickly pass through the stomach and the GI tract. You should not drink ionized alkaline water 45 minutes to 1 hour before or after taking medication or supplements. Do not drink ionized alkaline water with your medication or supplements. Use purified water or another liquid or water source. 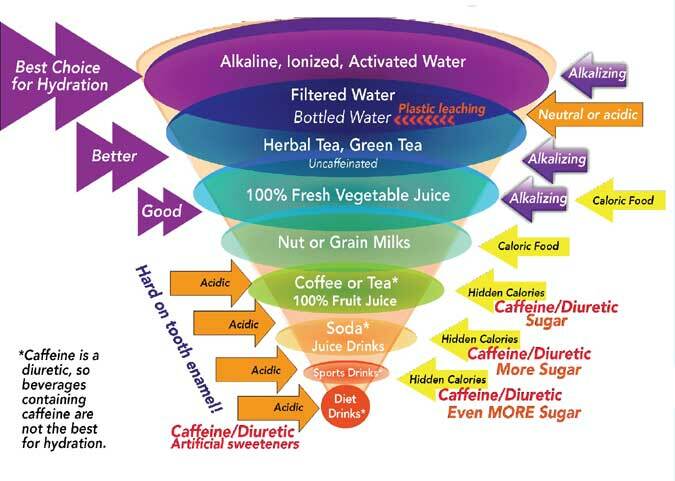 Alkaline ionized could neutralized the chemicals in your medication. Ionized Alkaline Water is an excellent source of hydration. Proper hydration can prevent and help your body overcome disease more effectively. You list the best times to drink water (morning, before bed, etc.) and the supposed benefits thereof (wake up the body, prevent heart attacks, etc). While I agree that water is good for the body, I question the medical validity of these statements, which sound more like opinion rather than fact. Where is the medical evidence to support these statements?